Southern Quintana Roo state is bracing for the arrival of Tropical Storm Earl, which continues to gain strength and may landfall there and in neighboring Belize as a hurricane early Thursday Aug. 4. Hurricane warnings were issued Wednesday Aug. 3 for the Bay Islands off the north coast of Honduras and continue for the Belize coast northward to Puerto Costa, Mexico. This includes Belize City and Chetumal, Quintana Roo. Maximum sustained winds have increased to near 70 mph (110 km/h) with higher gusts. Additional strengthening is forecast during the next 24 hours, and Earl is likely to become a hurricane late Wednesday Aug. 3. Weakening is expected after the center of Earl moves inland. Tropical storm force winds extend outward up to 90 miles (150 km) from Earl’s center. Tropical storm warnings extend northward to Punta Allen, Quintana Roo, but do not include Cancun or Cozumel. (MAP: weather.com) Earl’s Warnings: Both hurricane and tropical storm warnings are shown. Tuesday night, the center of Earl reformed a bit farther south than the previous center, and the NHC noted a partial mid-level eye was suggested in microwave imagery. 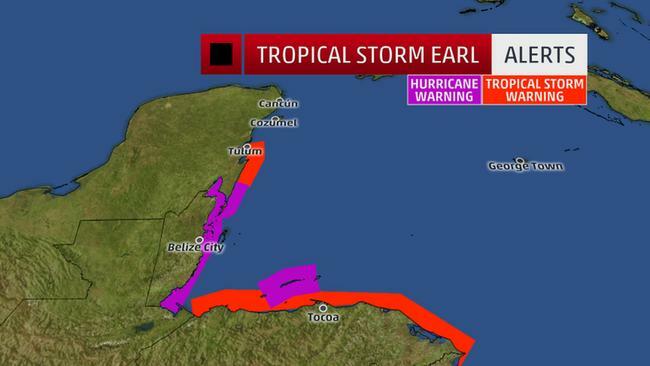 The center of Earl was located about 250 miles east-southeast of Belize City, Belize, Wednesday morning. Earl’s forward speed had slowed over the past 24-48 hours, moving west at 14 mph. Some bands of rain were already wrapping into parts of Honduras, and clusters of heavy rain well ahead of Earl were already soaking parts of Central America, including Belize and Guatemala. First up, the center of Earl is likely to hit the Bay Islands of Honduras Wednesday. Thanks to strong high pressure aloft over the southern United States, Earl will be steered toward the coast of Belize or Mexico’s Yucatan Peninsula early Thursday. With wind shear not too strong, a moist atmosphere, and the typically warm sea-surface temperatures of the western Caribbean Sea, Earl is expected to continue gaining some strength before landfall either as a strong tropical storm or low-end hurricane. (MAP: weather.com) Projected Path: The red-shaded area denotes the potential path of the center of the tropical cyclone. Note that impacts (particularly heavy rain, high surf, coastal flooding) with any tropical cyclone may spread beyond its forecast path. This would be the first hurricane landfall on the Caribbean side of central America since Category 1 Hurricane Ernesto almost exactly four years ago. Beyond that, it remains uncertain whether Earl’s center will re-emerge over the Bay of Campeche Friday into early Saturday. If it does, there’s a chance for some minimal re-intensification before the center slides back over land this weekend in eastern Mexico. Otherwise, the remnant will simply slide over land, raining itself out over southern Mexico this weekend. Rainfall totals of 8-12 inches (locally higher) are possible along the path of Earl in parts of Belize, Honduras, Guatemala, and southern Mexico, including the Yucatan Peninsula. Dangerous flash flooding and mudslides are possible through the weekend in these areas. Storm surge may raise water levels up to 3-5 feet above normal tide levels, the National Hurricane Center said. This could cause some coastal flooding along the immediate coastline of the Honduran Bay Islands, Belize, adjacent parts of Mexico’s Yucatan Peninsula. Battering waves riding atop the surge may also lead to additional damage and flooding. Hurricane-force winds may arrive first in the Bay Islands of Honduras later today, then spread to the Belize coast and possibly Mexico’s southern Yucatan Peninsula in the hurricane warning area overnight tonight into early Thursday. Tropical storm-force winds are expected on the rest of the northern Honduran coast today into early Thursday. The track of Earl will remain well south of the U.S. However, some increase in showers may spread to parts of South Texas this weekend.